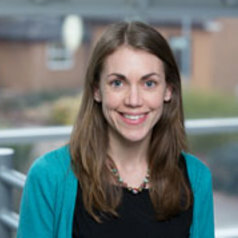 Janice Atkins is a Research Fellow, who joined the Epidemiology and Public Health group at the University of Exeter Medical School in October 2015. Janice’s role is to analyse novel risk factors and genetic variants associated with ageing well, using data from the UK Biobank study. Janice graduated with a BSc in Human Biology from Loughborough University, before working as a Research Assistant at the Twin Research and Genetic Epidemiology Unit at King’s College London. Janice then joined Public Health England (formerly the Health Protection Agency), as a Scientist for the National Chlamydia Screening Programme. Whilst working here Janice also completed a part-time MSc in Epidemiology at the London School of Hygiene and Tropical Medicine. Prior to joining the University of Exeter Medical School, Janice undertook a PhD at University College London, funded by the National Institute for Health Research School for Primary Care Research (NIHR SPCR). Janice’s PhD explored the effects of body composition and dietary patterns on the risk of cardiovascular disease and mortality in older age, using longitudinal data from the British Regional Heart Study. Janice’s research interests include the epidemiology of ageing and specifically the effects of obesity, sarcopenia and diet quality on the risk of cardiovascular disease and ageing related conditions.